Atom models represent the three main parts of an atom: protons and neutrons--which combine to make the nucleus--and electrons, which orbit the nucleus like planets around the sun. This is the model designed by Dr. Niels Bohr, a physicist who won the 1922 Nobel Prize in physics for his discoveries in atomic structure and radiation. A more modern model--the quantum-mechanical atom--would show only clouds of probable locations for electrons, not discrete orbiting objects. Bohr planetary models are easier to build and acceptable for general concepts. Consult a periodic table of elements or a physics or chemistry textbook to learn the number of protons, neutrons and electrons in the various helium atoms. Choose the helium isotope you wish to build. The most abundant form of naturally occurring helium contains two protons (P), two neutrons (N) and two electrons (e). The next most abundant form has one less N, and the artificially created forms, with different numbers of Ns, all disintegrate radioactively within less than one second. 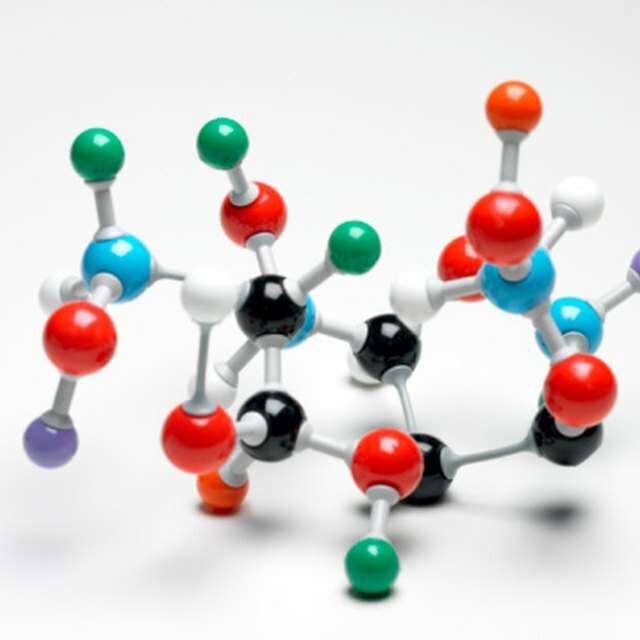 Build this model for the most common form of natural helium: 2P, 2N, 2e. Color or paint two spheres with each of the three colors. For example, make the two P-spheres one color, two N-spheres a second color and two e-spheres a third. There is no standard color scheme, so you can use any three-color combination. Print N, P or e on the respective spheres in black. Thread the two e-spheres onto the wire (pierce the spheres with the wire), bend the wire into a circle, joining the ends, then slide and glue the balls into position on opposite sides of the circle. These are the two electrons sharing their orbit. Glue the two P-spheres and the two N-spheres together in a square pattern. This is the nucleus. Be sure the glue is firm before moving to the next step. Drill a 1/4-inch hole though the spheres of the nucleus so the dowel passes through the diagonal of the square pattern. Thread the nucleus onto the dowel and lay it on a flat surface. Do not glue it in place yet. Position the circular e-sphere wire so the nucleus is in the center. Rotate the circle so the e-spheres lie to the right and left of the dowel. Adjust the dowel along the diameter of the circle so one end just touches its inner edge. Apply glue to each point of contact between the dowel and nucleus and the dowel and the wire circle. Drill a 1/4-inch hole in the center of the 4-inch-by-4-inch-by-1-inch block. Insert and glue the end of the dowel into the hole so the model stands vertically above the block. Your helium atom model is ready to display. This model stands about 18 inches high with the circular e-orbit extending about 8 inches across. Similar methods may be applied to building atomic models of other elements and may be scaled up or down as long as all proportions remain constant. Wear safety glasses while drilling and use caution with hot glue. Be sure glue is firm before moving to a next step. Pickut, Walt. "How to Build the Atomic Structure of Helium." 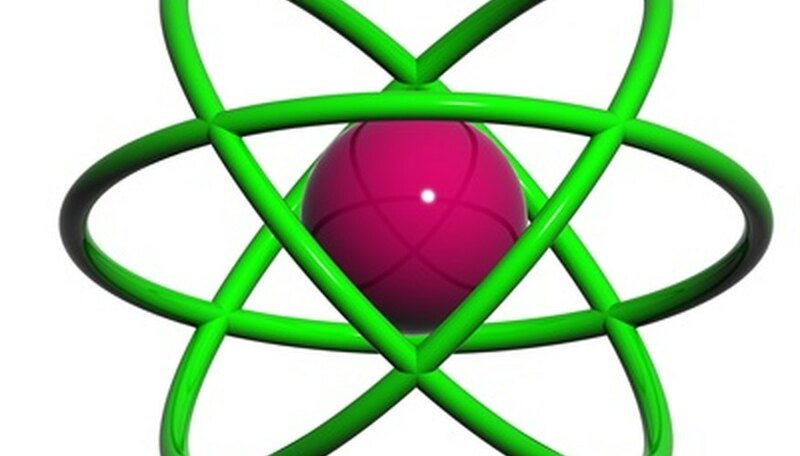 Sciencing, https://sciencing.com/build-atomic-structure-helium-6201551.html. 24 April 2017.